This year my mom came to visit, her first trip to Europe. 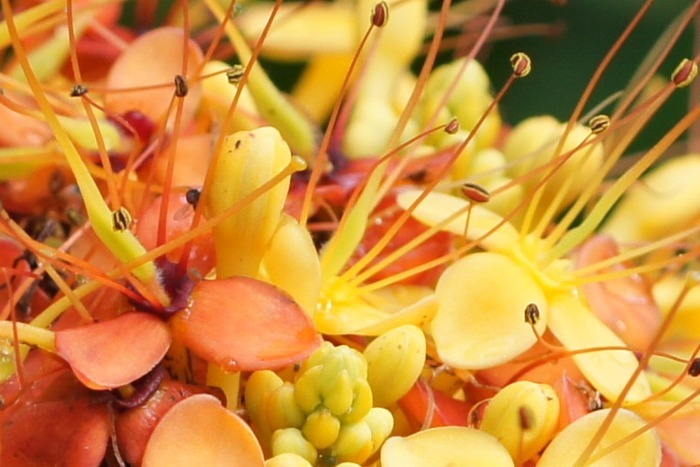 In my five years living in Amsterdam I had never been to the Hortus Botanicus, so we decided to go. We figured it would only take a couple of hours - after all, the entire Hortus is smaller than most midwestern back yards. 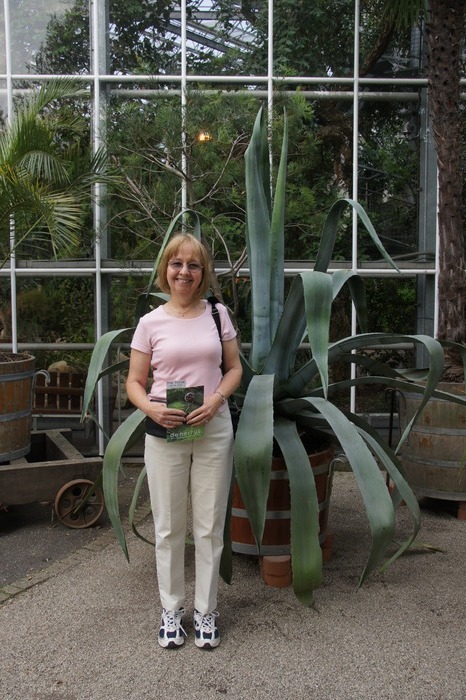 Obligatory tourist shot by the century plant. 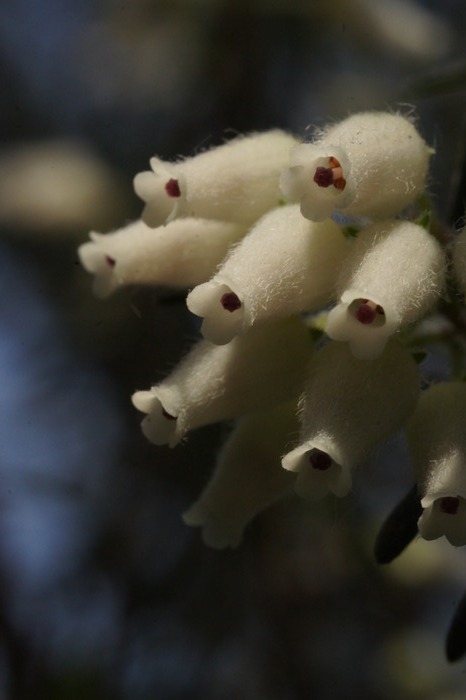 These plants flower only once, after growing for 30 years. Perhaps more importantly, it is the plant used to make mezcal. 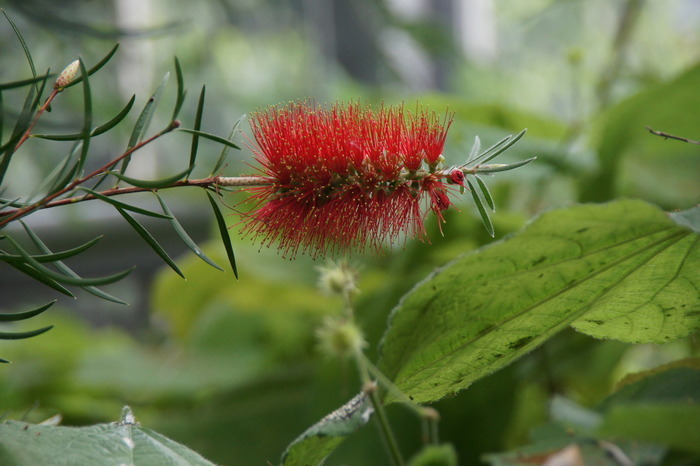 Bottle brush flower, Callistemon sp. They are native to Australia. 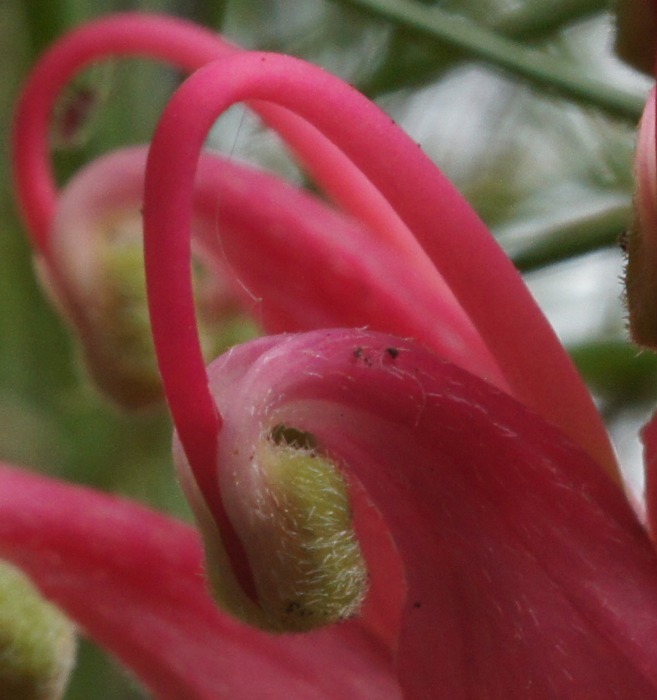 A South African flower, Erica caffra. 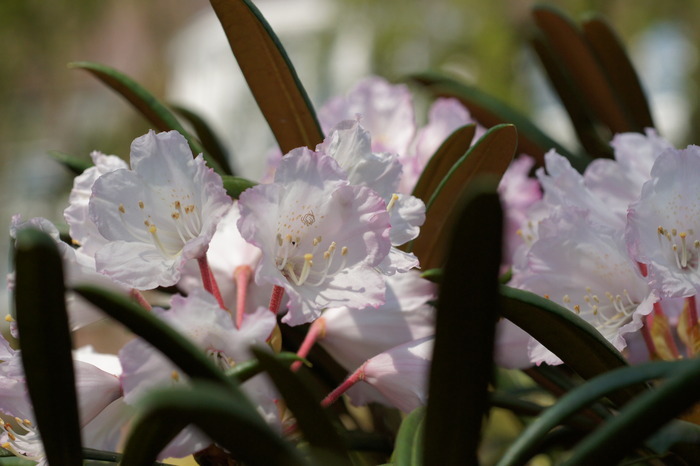 They are in the same family as rhododendrons and blueberries. 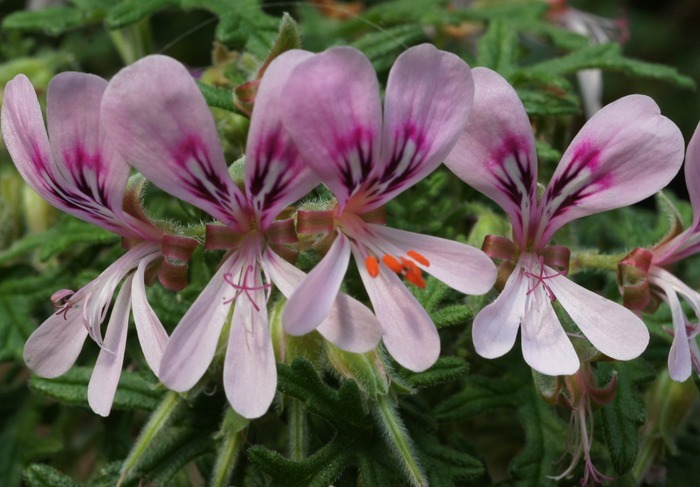 Pelargonium species, possibly Pelargonium radens but it's difficult to tell which sign belongs to which plant. To me it looks like an alien insect, head turned to look at something in the lower left, and legs raised slightly in anticipation. 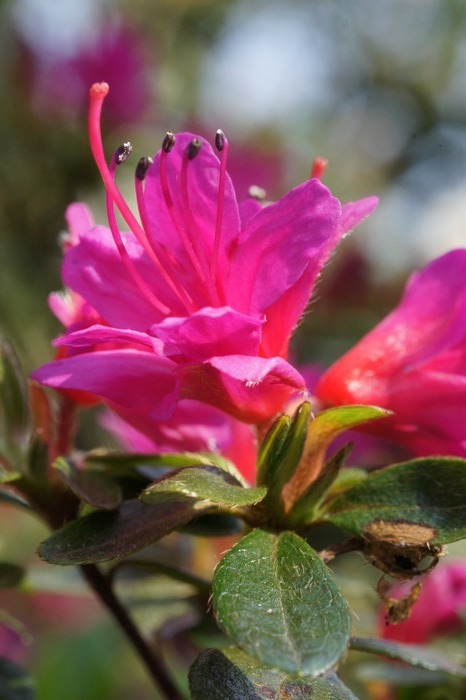 Most garden geraniums are actually in the Pelargonium family, though a few are true Geraniums. 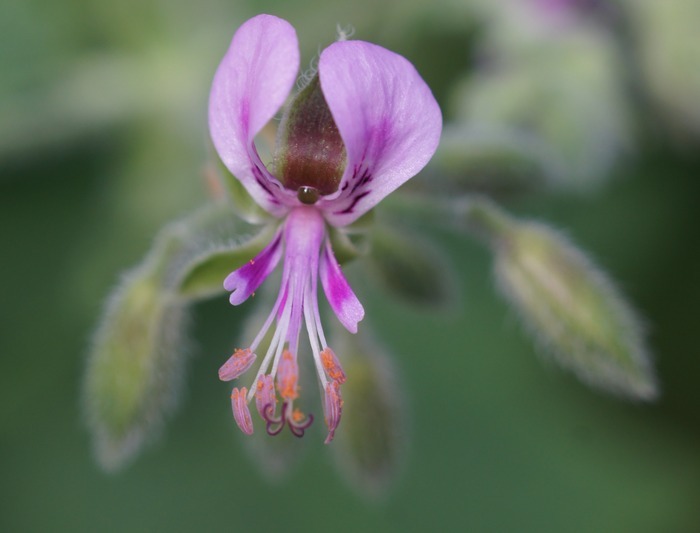 A related flower, probably Pelargonium pseudoglutinosum. 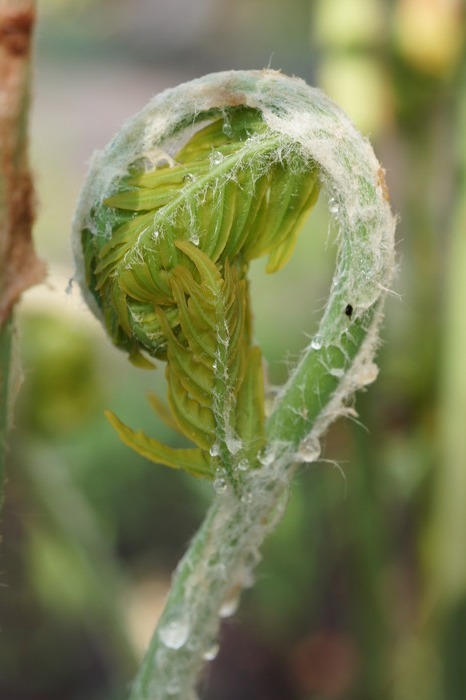 Pteris vittata, the ladder brake fern, has the unusual property of drawing arsenic out of the ground. It is being investigated for possible use in cleaning up areas which have been poisoned by too much arsenic from industrial waste. 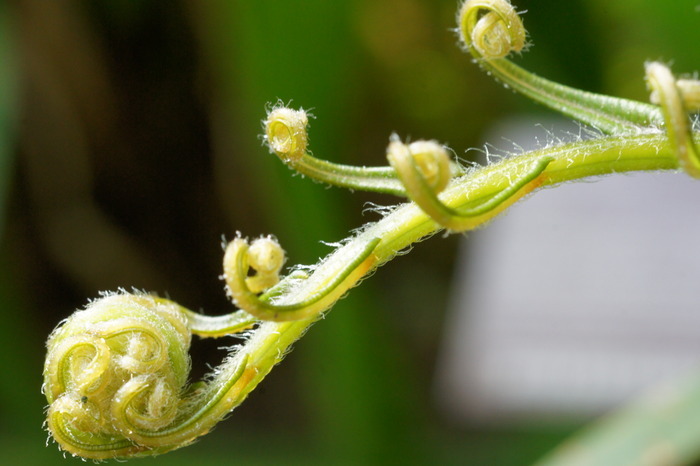 I like ferns opening their leaves... there is an air of delicate anticipation about them. 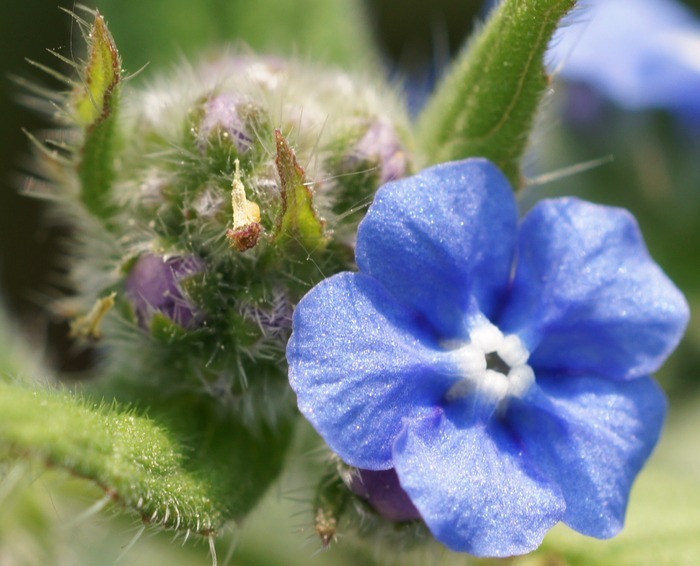 Pentaglottis sempervirens, overblijvende ossentong, green alkanet. 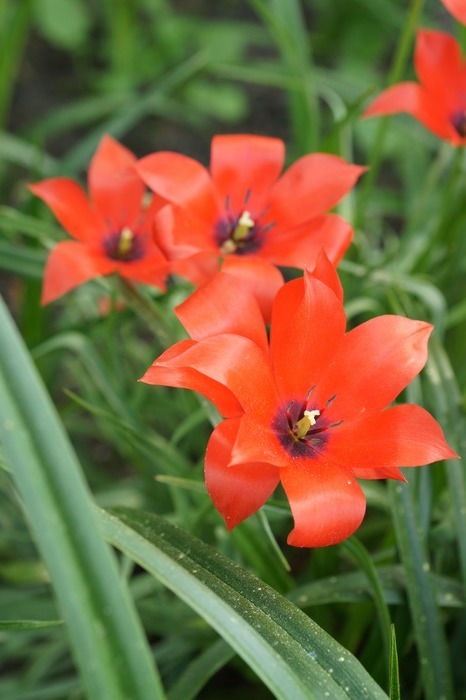 Rare in the wild but common in castle gardens, and invasive in the American west. Osmunda regalis, the koningsvaren, royal fern. 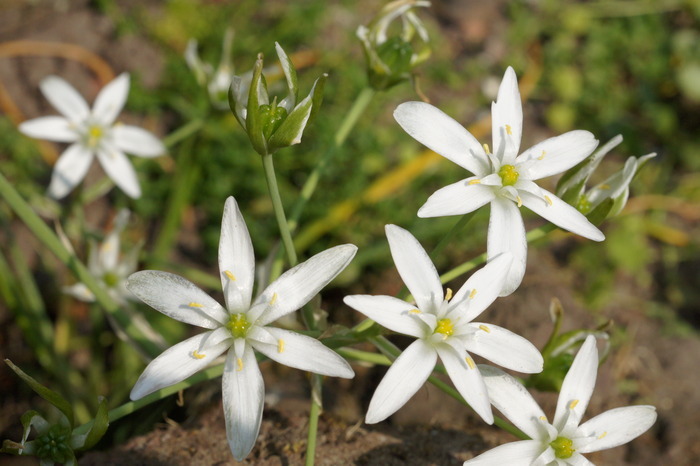 It grows up to 160cm tall (5 feet), but is becoming rare due to wetland drainage. 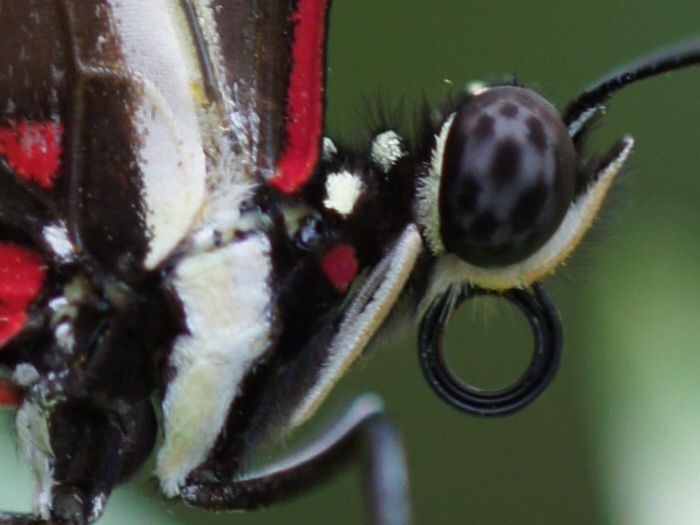 This one looks like it is thinking hard about something. 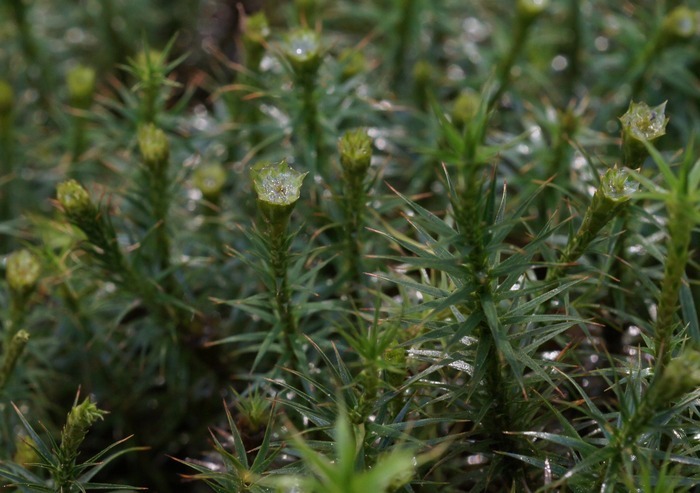 Droplets of water on the tips of moss growing in the carniverous plant garden. More ephemeral than diamonds, but just as beautiful. 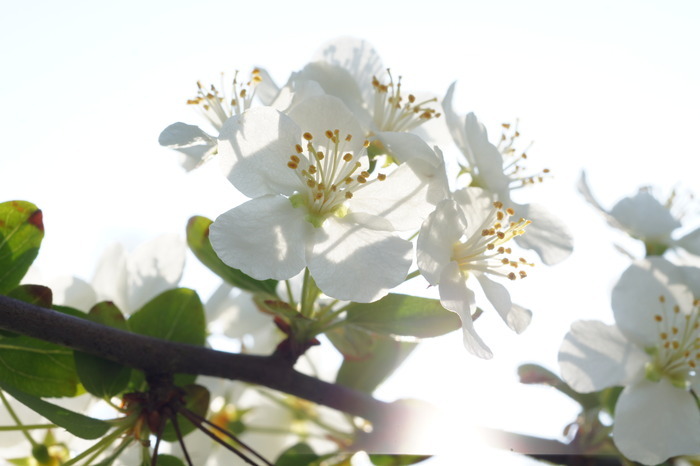 Malus sargentii, a Japanese ornamental in the apple family. 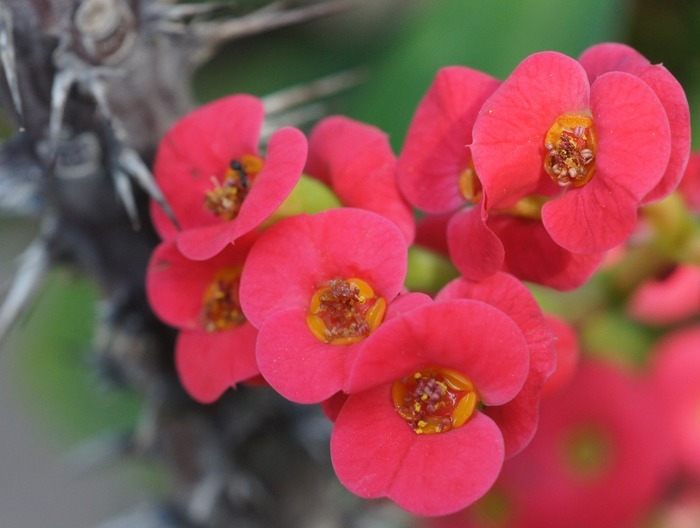 A careful tour of the desert greenhouse. In the desert, nearly everything is prickly. An evergreen forest in miniature, and in the desert. 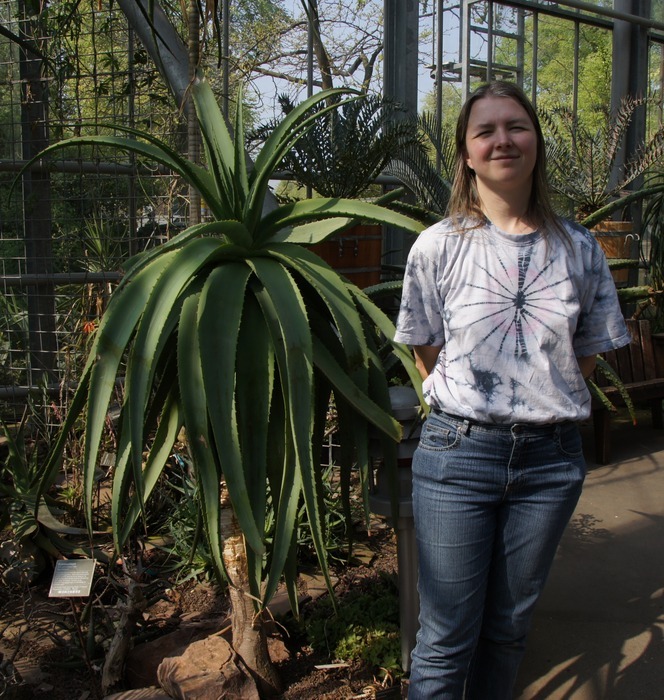 Me next to an Aloe arborescens, an aloe on a stick. 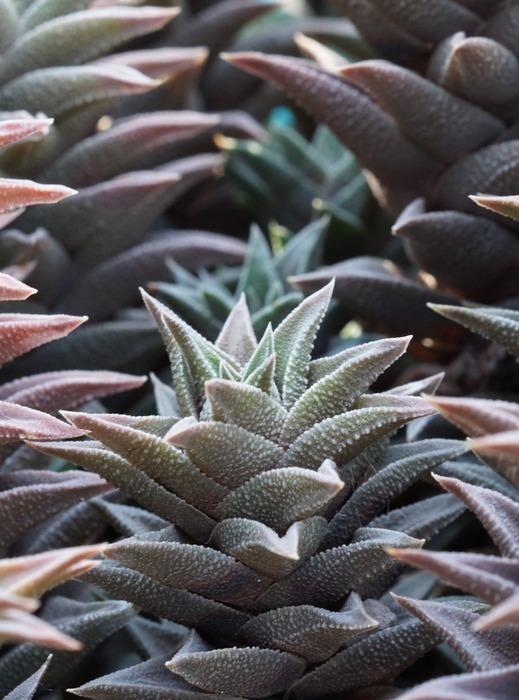 It is a relative of Aloe vera and has similar properties for treating burns. 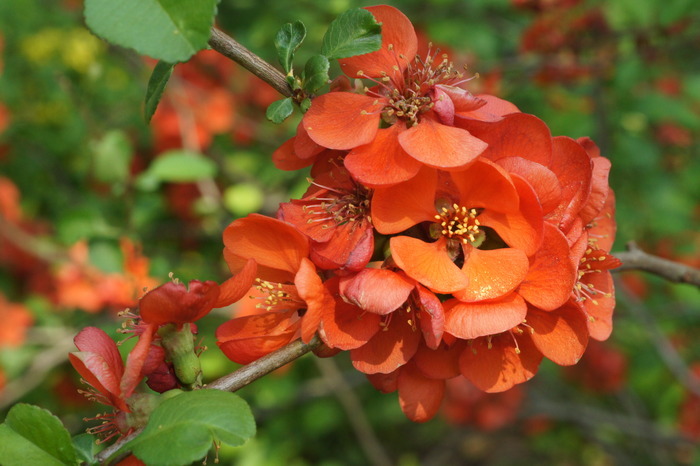 Chaenomeles japonica, Japanse sierkwee, or Japanese quince. Quince are fruit that is similar to an apple, but a different quince (genus Cydonia) are usually grown for food. 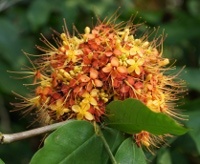 This kind is an ornamental, although the hard and astringent fruit can be fermented into hard cider or made into a jelly. Turdus merula or common european blackbird. (Quit laughing, turdus simply means thrush in Latin). 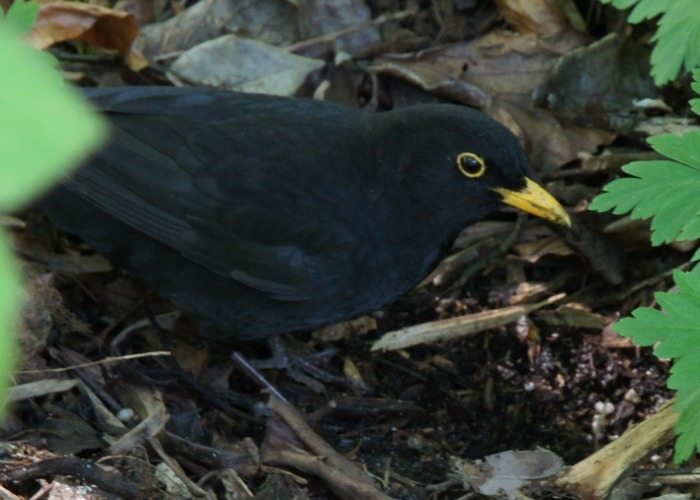 European blackbirds are great singers, with a complex, warbling song. I can only imagine the disappointment of European exploers when they encountered the similar-looking American blackbirds... which are in the crow family. 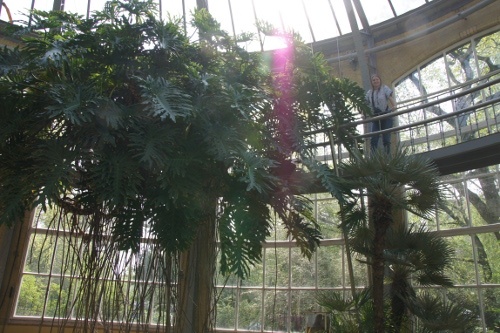 I spent some time walking under this tree before I realized that I was under the mother of all houseplants. This is a Philodendron bipinnatifidum, aka Philodendron selloum, in the same family as elephant ears and other common houseplants. 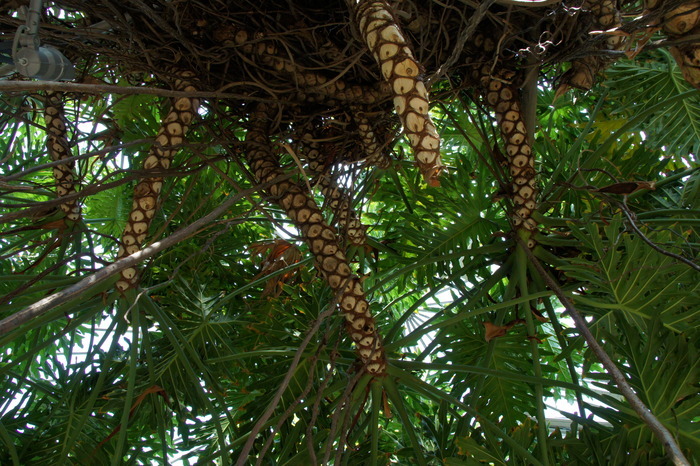 You won't get this kind of tree from just fertilizing your elephant ears, though. Philodendron is a highly varied genus, with some plants living as epiphytes (growing on tree branches), and others making their living by attracting colonies of ants to live among their roots and protect them from predatory insects. The photo below shows the scale; note that each leaf is about as big as me. 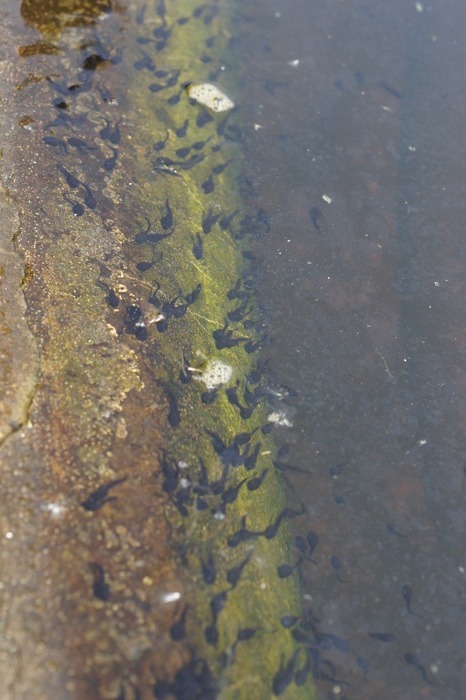 I've seen frog ponds, but the number of tadpoles in this little pond was simply unreasonable. There seemed to be plenty of mosquito larvae in the pond for them to eat, though. 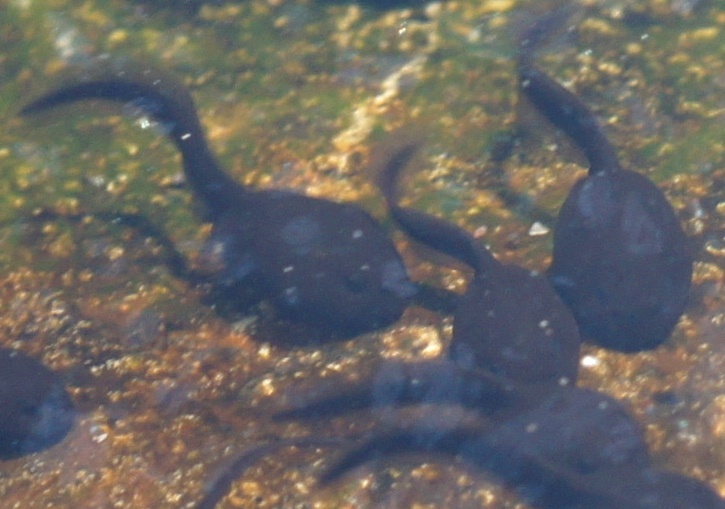 The glare made it tough to get much of a photo, but I did get a few of the tadpoles to smile for the camera. 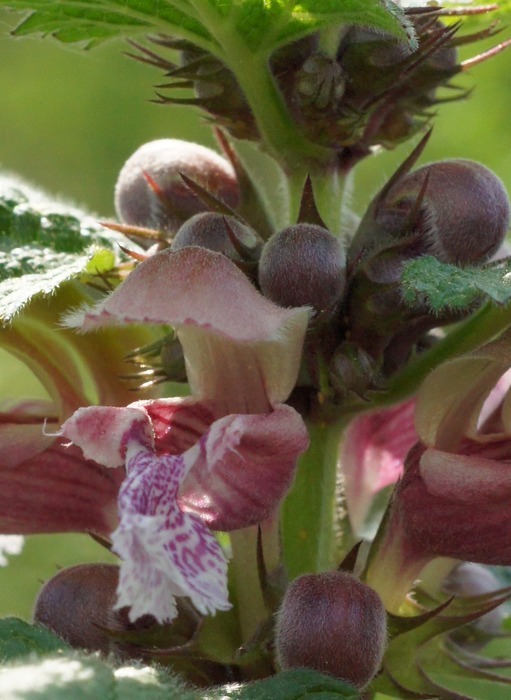 Lamium orvala, a distant relative of mint and a close relative of several common lawn weeds known as deadnettles . Parrots in Amsterdam? 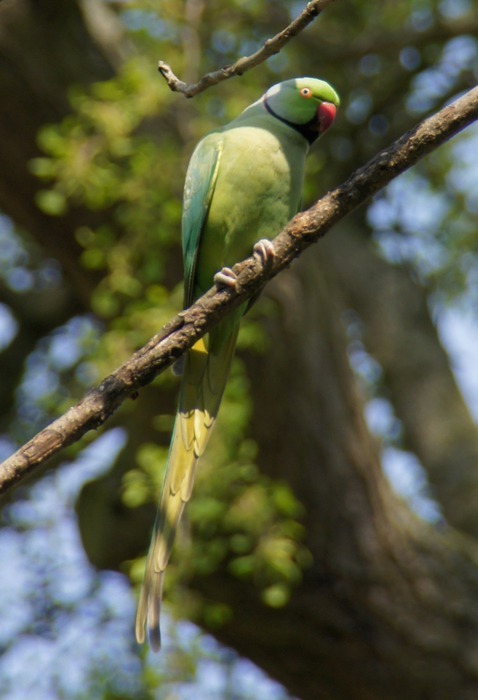 The rose-ringed parakeet, originally from India, has established itself in several European cities. No one knows exactly where the Amsterdam population started, but there are about 5000 birds in Amsterdam now. The population has doubled since 2004, but the birds seem to stay confined to the cities, where there are plenty of birdfeeders to supply them with seeds. 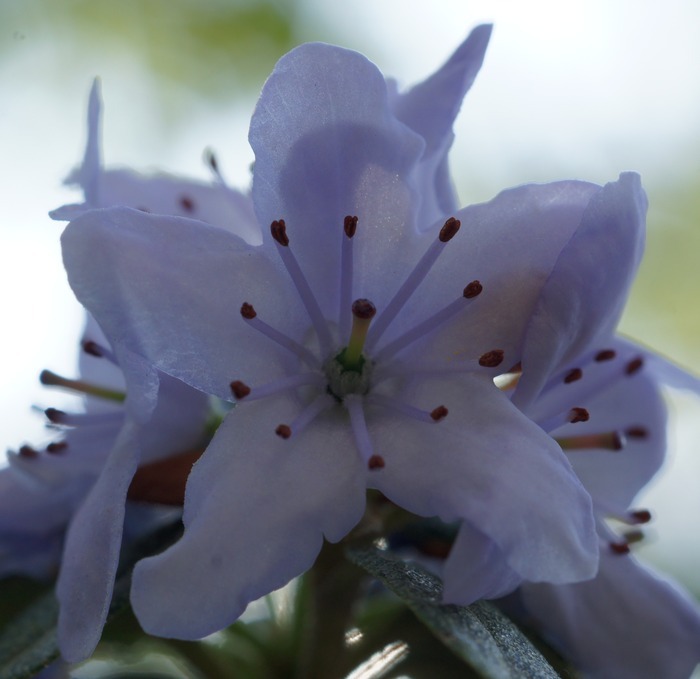 This, however, is not an accidental visitor, but an actual specimen in the botanical garden. 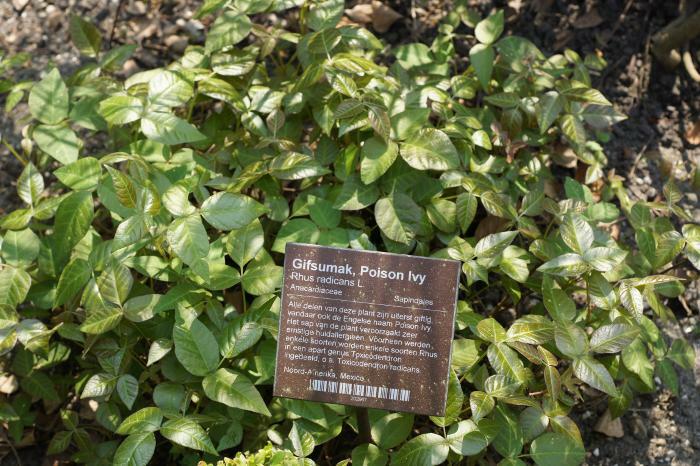 Sumak, a similar-looking but nontoxic relative, is a spice in Europe. 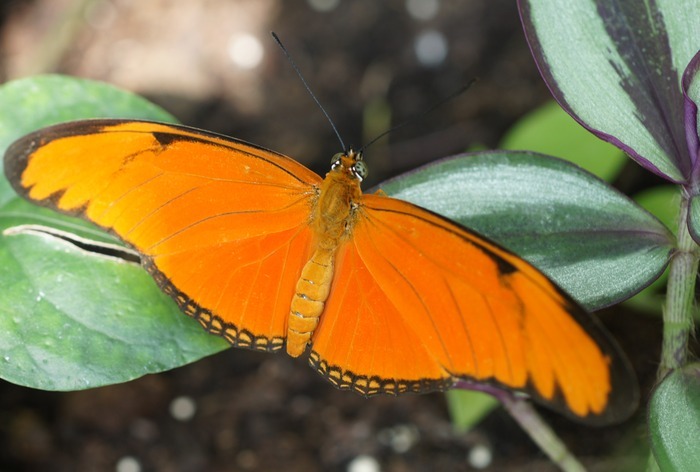 The butterflies are not accidental visitors, but kept in the butterfly house. 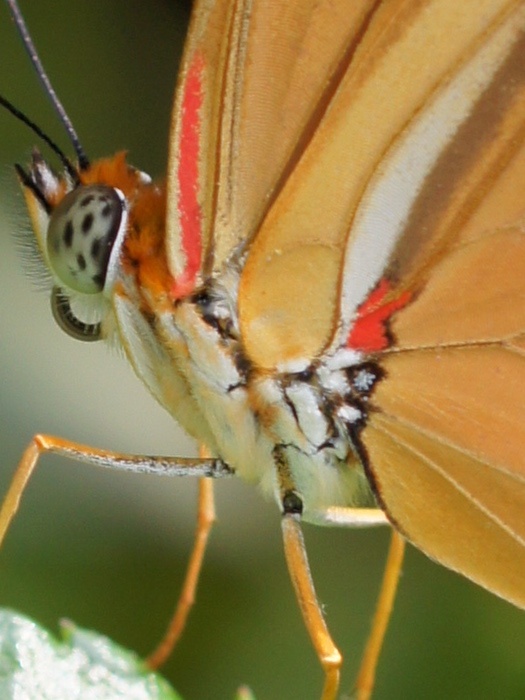 This particular butterfly house seems to be dominated by these orange butterflies, probably a Heliconius species. 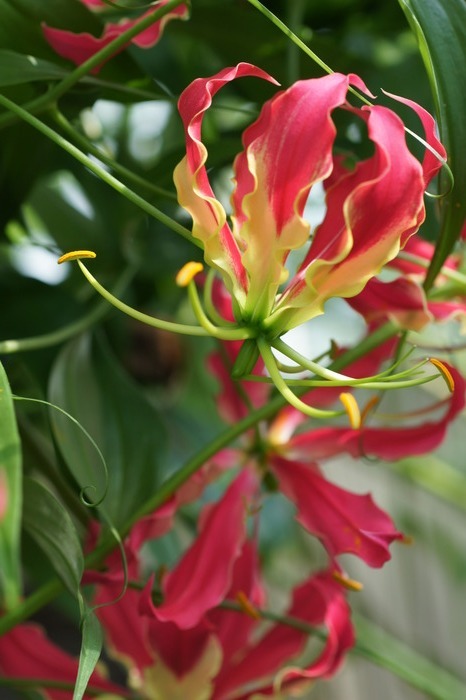 Flowers in the butterfly house, Gloriosa superba, a native of Africa and India. 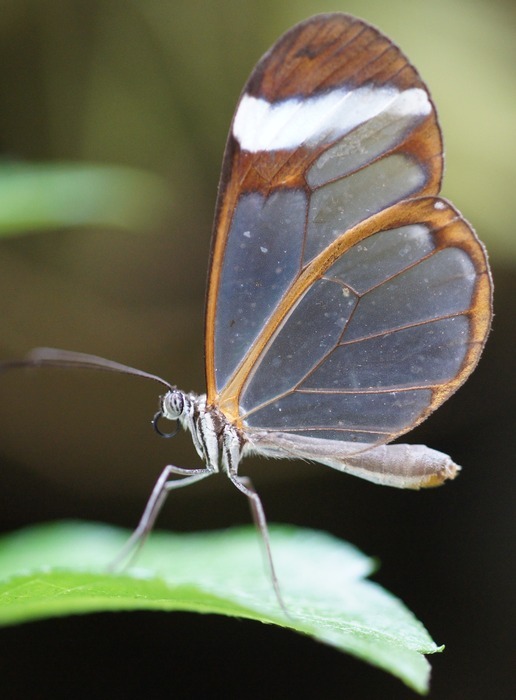 Glasswing butterfly, Greta oto. They really are hard to see, and you have to be careful in this greenhouse not to step on them. 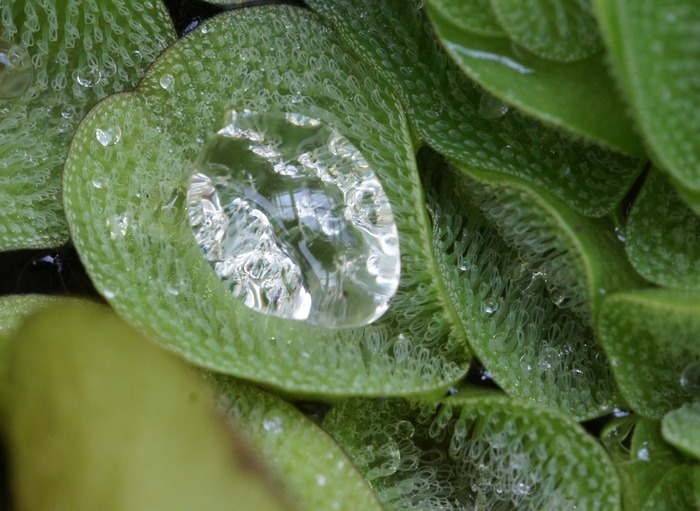 Another jewel of water, this time in the small water garden inside the butterfly house. 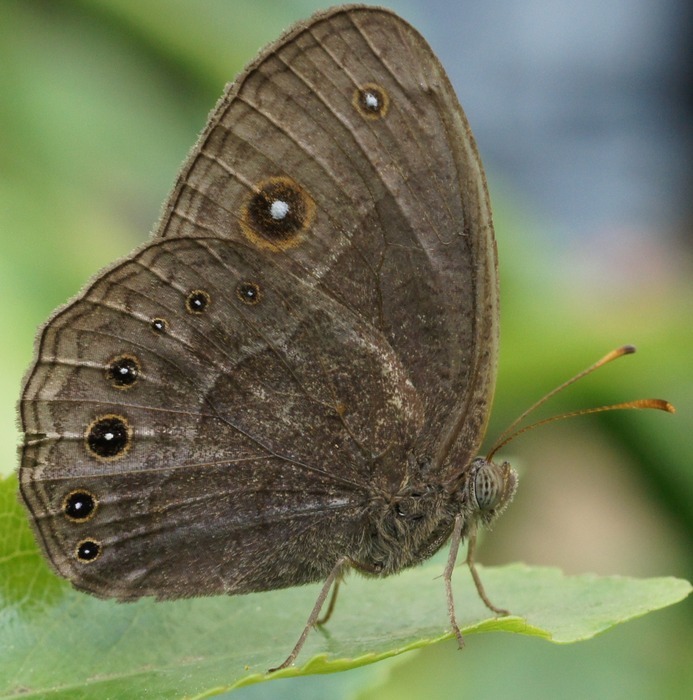 I'm not sure if this small, brown butterfly was a resident or a stowaway in the butterfly house. 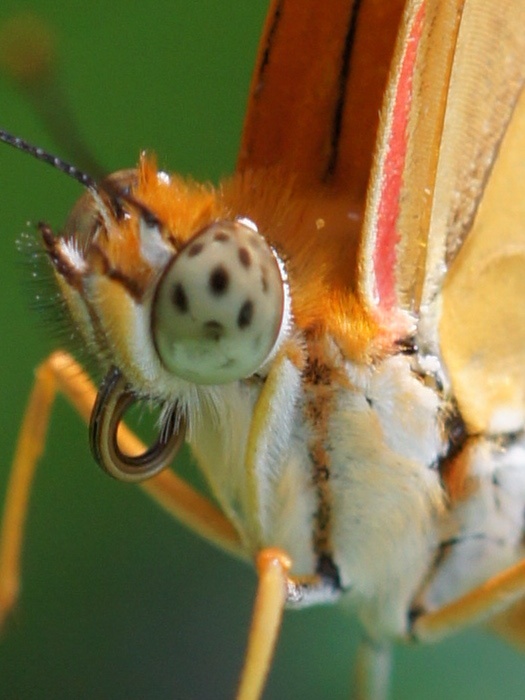 It is probably a Satyrinid, and possibly Lasiommata petropolitana, the European wall brown butterfly, which is common throughout Europe. 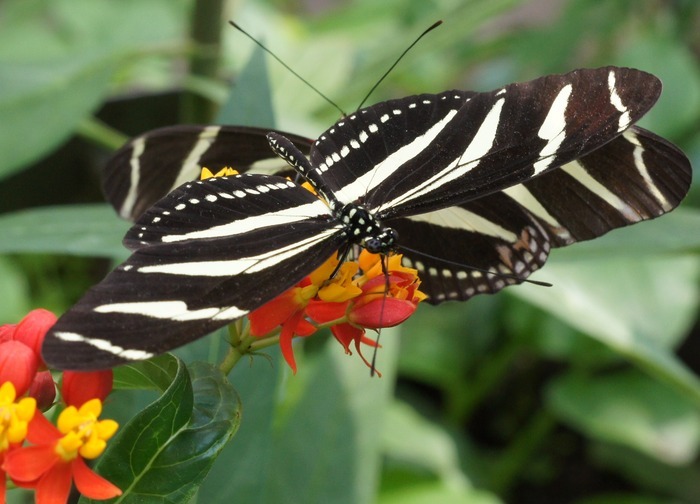 A couple of zebra longwings on flowers. Back outside, unknown white flower. I like the composition of this picture. Iris, specifically Iris sanguinea Donn ex Hornem. 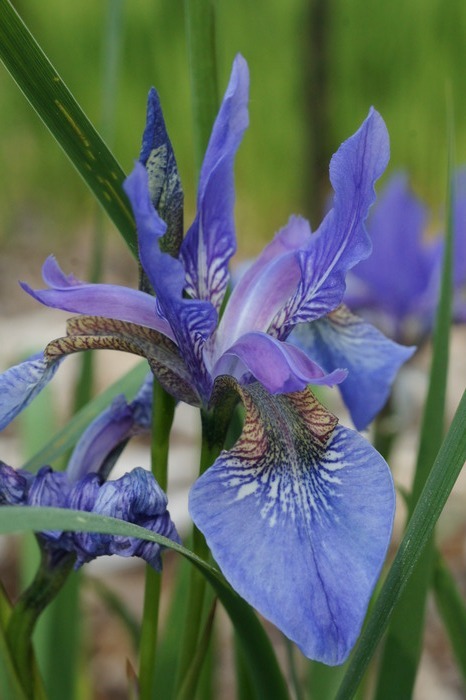 There are over 200 species of iris, many of which can be found in gardens around the world.